Okay, I’ve been hiding it for too long. I have an addiction. I’m addicted to online shopping. More specifically, I’m addicted to sales and online shopping. Naturally to get these great deals, I’ve had to sign up for an insane amount of newsletters and subscriptions. Every morning, my inbox would would have 25-30 new emails of whatever deal of the day my favourite stores were having. I was getting so irritated, I’d barely glance at them before stabbing the delete key with increasing aggression. Basically, all you do is input your email to get an entire list of your subscriptions. On the same page, you can unsubscribe the emails you no longer want to receive and add the ones you still want, to a daily rollup. 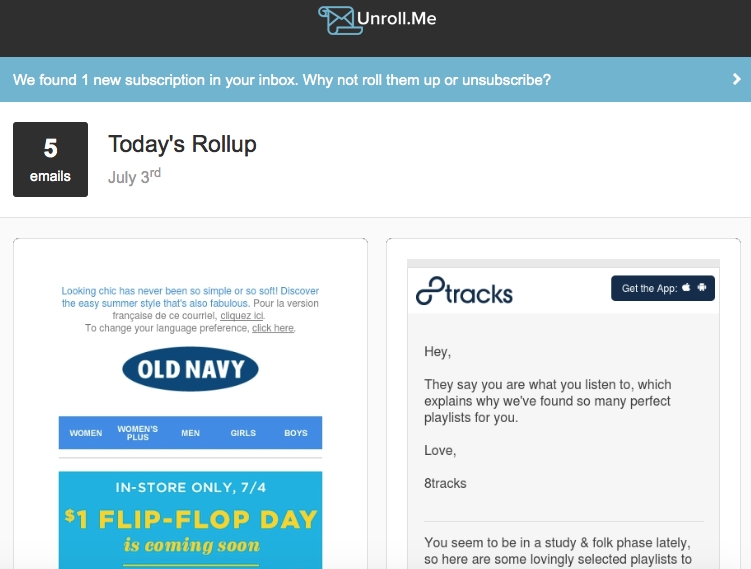 The rollup will collect all the subscriptions you still want in one email. Just choose what time of day you want the rollup to come in and BAM, inbox zero is yours. The website also monitors what new subscriptions you may have signed up for, and reminds you that you can roll it up into the next day’s email, or unsubscribe all together. The entire process took maybe 10 minutes and it saves me time every day when I check my email. I went from having 27 emails in the morning to maybe two, not to mention the satisfaction of having an empty inbox. After unsubscribing a few emails the site will ask you to share or invite to keep going but that’s incredibly easy to get around. Aside from sharing it on Facebook or Twitter, you can also invite friends by email. Send it to your parents (they won’t know how to use it anyways), siblings, and even to your old emails. They’ll just receive a simple invite email and absolutely no information about what you’re subscribed to. You know, in case you were worried about that sort of thing. Having zero messages in your inbox can be a real thing y’all!